At the Alfred E. Smith Memorial Foundation white-tie event in New York last night, presidential candidates Donald Trump and Hillary Clinton sat within groping distance of one another—and delivered speeches for a largely-Catholic audience. A traditional and restrained roasting of oneself and one's opponent, the dinner speeches mark the final public event where the two will tangle before election day. 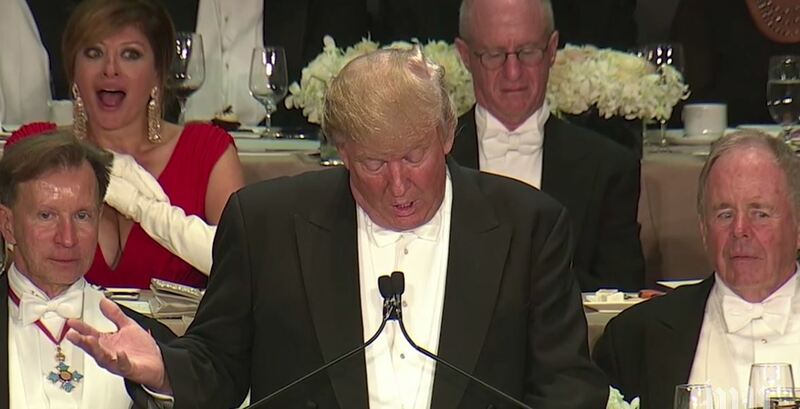 And, as you may already have predicted, Donald Trump managed to get himself booed at a charity dinner. “Hillary is so corrupt, she got kicked off the Watergate Commission,” Trump said, citing a false Internet rumor as the crowd turned on him and started to boo, something that simply doesn't happen at lavish charity dinners at the Waldorf Astoria hotel. The face of one the guests sitting on the stage behind him was suddenly struck with horror. “Hillary believes that it's vital to deceive the people by having one public policy and a totally different policy in private,” Trump said, as the booing intensified. The real loser of the night? Rudy Guliani, who sat simmering like a dollar store Mussolini while Hillary dumped on him with her best line of the night.